This page describes how to use the webdav protocol. For an overview of storage clients, see Storage clients. It uses the common port 443. Some overly strict firewalls may block outgoing traffic, but port 443 is so common that it is seldom blocked. However, using WebDAV to bypass firewalls should be seen as a temporary solution; it would be better to open up your institute’s firewall to allow access to the dCache subnet. It can transfer data over a secure channel; other protocols like GridFTP do authentication over a secure channel but transfer data unencrypted. It is not a high performance transfer protocol. If this is important, use GridFTP instead. Support by WebDAV clients varies widely. Some operations (like renaming a file) may not work in certain clients and circumstances. Modifying/overwriting a file, although the WebDAV protocol supports it, doesn’t work on dCache; you’ll need to delete the old file and upload the new file instead. The most important consideration is whether you want to authenticate with username/password or with x509 (certificate/proxy). See the above table. All WebDAV doors support macaroons (bearer tokens). Another important consideration is whether a WebDAV door should redirect or not; this affects transport security and throughput. It’s a form of load balancing, which improves the speed. Redirecting WebDAV doors do the authentication over HTTPS, but they redirect your client to an HTTP port. So the data transfer is unencrypted. This too improves speed. File transfers are sent over HTTP, so they are not encryted. A “man in the middle” might be able to read the data, or even modify it in transit. If privacy is a concern, choose a door that does not redirect. Some WebDAV clients don’t handle redirects very well. If transport security is a requirement, we suggest to use the WebDAV doors on port 2881 or 2884 for the best transport security. They use only TLSv1.2 or better, and they are configured with encryption ciphers that offer Perfect Forward Secrecy. They have some extra HTTP security headers that may make abuse more difficult. There might be some clients that have difficulties connecting to these high security doors. If data security is important to you, we suggest you find clients that do support these improved security settings. In the future, these settings will be applied to ports 2880 and 2883 as well. Another consideration is whether you’re using the door for parallel access. webdav.grid.surfsara.nl is a DNS round robin that will direct you to a (more or less) random host in a pool of WebDAV servers. So it is very well suited for parallel access. The other host names are not powered by a group of nodes, so they are less suited to parallel processing. 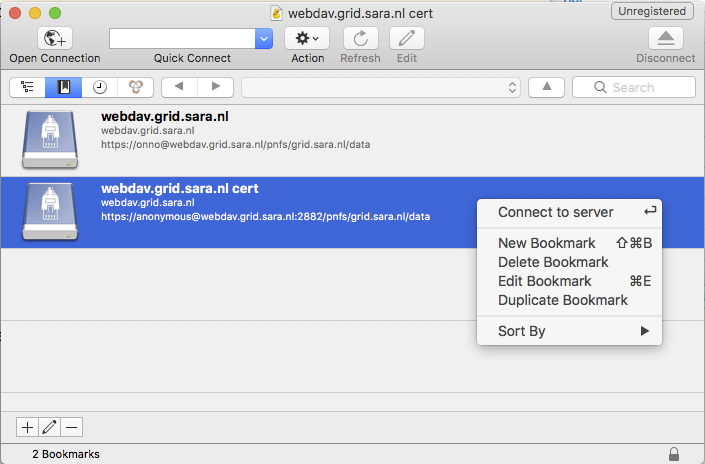 Use webdav-cert.grid.sara.nl when you want to authenticate with a user certificate or proxy, and your institute’s firewall blocks outgoing connections to port 2882 to 2884. It’s a single virtual machine; don’t use it for parallel processing. It is configured with the best security settings, like the ones on port 2881 and 2884. All WebDAV doors are dual stack: they support both IPv4 and IPv6, with IPv6 as the preferred protocol. Use ipv4.grid.surfsara.nl for storage clients that have problems with IPv6. It’s a single virtual machine; don’t use it for parallel processing. We’ll describe how to use them below. The easiest way to access dCache is with a normal web browser. You can point a browser like Firefox to https://webdav.grid.surfsara.nl/pnfs/grid.sara.nl/data/ or any of the other WebDAV doors listed in the table above. When the browser asks for a username and password, you can provide your Grid UI (or CUA) username and password. An icon in front of each file indicates the locality of the file (tape or disk). When you click on a listed file, it will be downloaded, if you’re authorized to do so. You can’t upload to dCache WebDAV with a normal browser. There is a new interface, dCache View, that allows you to upload files from your browser. This is still in development, so test it first before using it for production data. To run the examples below you need to have a UI (or CUA) account that is configured within dCache and authorized to the data you want to access. Contact us if you need assistance with that. If on your system there are no Grid CA certificates available in /etc/grid-security/certificates/, please read host_certificates. It is possible to specify the password on the command line like this: --user homer:password. However, for security reasons this should be avoided on shared systems (like the UI) because it allows other local users to read the password with the ps command. The --ca-directory is probably not necessary anymore. If it is, but you don’t have an /etc/grid-security/certificates directory, you could specify --no-check-certificate, but we don’t recommend this. 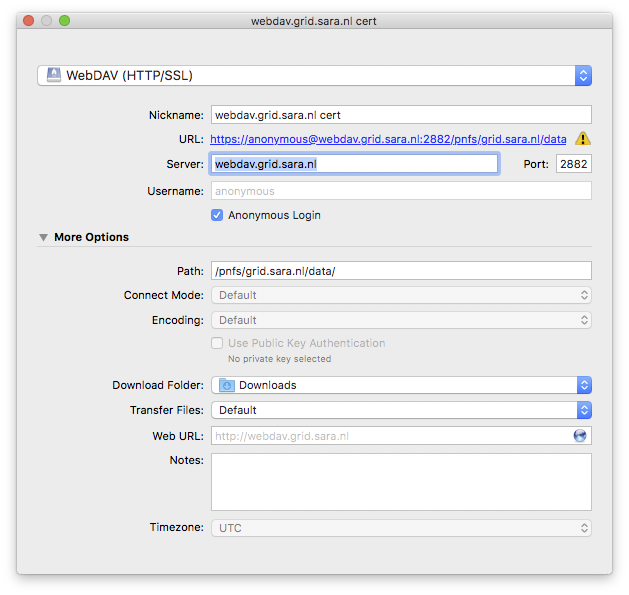 To download a file while using a proxy to authenticate, you first have to create your proxy, see StartGridSession. It is possible that your proxy DN is mapped to another user account than your own CUA user account. If you have permission issues with either username or proxy and not the other, contact us to check the user mapping. Note: wget does not support certificate/proxy authentication. File properties and locality are not changed. A file that is stored on tape (nearline) will stay on tape, even if it is moved to a directory for disk-only files. --location-trusted will send the username and password also to the destination server. Port 2880 is used for username/password authentication. With curl and a dCache WebDAV door, it’s possible to request file properties. This works both with username/password and proxy authentication, provided you use the correct port (443 or 2880 for username/password, 2882 or 2883 for proxy authentication). See Staging files for more information about file locality. This example shows how to get the Adler32 checksum of a stored file. dCache uses Adler32 checksums by default, but this can be configured per project. The returned checksum comes from the dCache database, so it is a very efficient way to check your files. dCache does checksum checks on most operations, so you can safely assume the checksum matches the stored file. dCache is configured to use Adler32 checksums by default. However, in some cases, dCache may have a file’s MD5 checksum in its database. You can use WebDAV to retrieve the MD5 checksum of a file, when it is in dCache’s database. It’s a bit more complicated than Adler32 because MD5 checksums are presented in base64 encoding, as prescribed by RFC 3230. Rclone is a command line tool that you can download from https://rclone.org/downloads/. It works on many platforms and it can talk to many storage systems besides WebDAV. There is also a disadvantage: it uses only username/password authentication; not X509 certificate/proxy authentication. You’ll have to use your CUA credentials and write to a directory where you are permitted to write. Because of this, Rclone is best suited for uploading or downloading large datasets; lacking X509 client authentication, it’s not suited for batch processing. The first time you use rclone, you need to make a profile with rclone config. 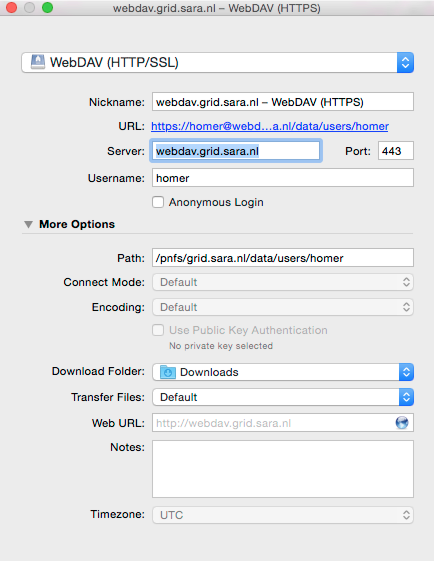 You can use for example https://webdav.grid.surfsara.nl:443/pnfs/grid.sara.nl/data/lsgrid/homer (for performance) or https://webdav.grid.surfsara.nl:2880/pnfs/grid.sara.nl/data/lsgrid/homer (with encrypted transport). More information on how to use rclone with WebDAV is here: https://rclone.org/webdav/. There are also graphical user interfaces to rclone; one is RcloneBrowser. Macaroons are a new feature in dCache and have not been fully tested. There may be some risks involved. Always add sufficient caveats to your Macaroons to avoid abuse. Please contact us if you want to use them. Macaroons are bearer tokens that authorize someone to access certain directories or files. With this technique, you can share (some of) your data with anyone else. 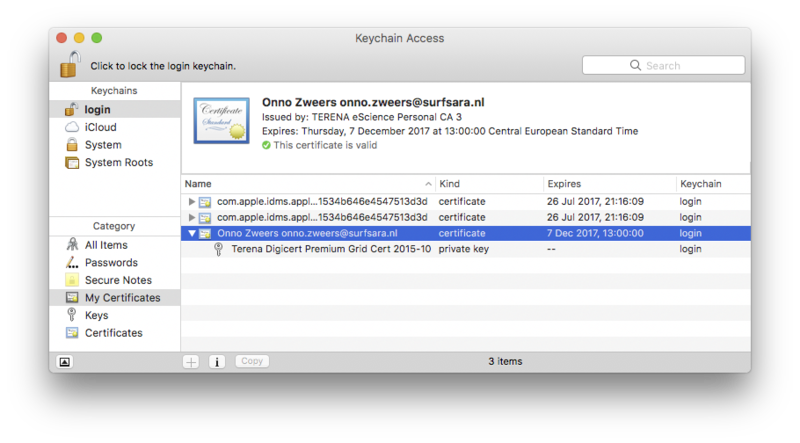 The other person does not need to have a user account or a certificate; only a WebDAV client that supports bearer tokens. Clients that support this are Curl, Rclone and (read only) ordinary browsers such as Firefox. Cyberduck does not support it (yet). A Macaroon may contain caveats that limit access. Such caveats can be based on the data path, the activities that may be performed with the data (list, download, upload, etc. ), the IP address of the client, or a maximum validity period. The printed link can be pasted into a browser’s address bar, or provided as an argument to curl for download. Send this file to the persons you want to share data with. They need rclone v1.42-012-gfa051ff9 or newer to access the data. You can get a Macaroon with X509 authentication too. Please note, that port 2883 is used for this. The lifetime of your proxy does not limit the lifetime of the macaroon. To work with WebDAV on Windows or Mac OS X, you can install Cyberduck from here: https://cyberduck.io/. Please note that the App store package costs money; the download from the website is free, but will ask for a donation. Download the .zip file, open it, and drag the .app file into your Applications folder to install it. Normally, one would authenticate to dCache using a user certificate or proxy. dCache determines your identity based either on your user certificate or proxy DN, or on your VOMS credentials. However, if you authenticate with your CUA username & password, that identity might not be the same and you may not have access to your own data. To work around this, it may be useful to have Cyberduck authenticate you using your user certificate. Most users are authenticated based on the VOMS credentials of their proxy. Since you will not use a VOMS proxy but a certificate, this identity mapping won’t work and you may not have access. Instead, we may need to map your DN onto the desired identity instead of your VOMS credentials. If you want to use Cyberduck with certificate authentication, contact us so that we can map your DN to the desired identity. 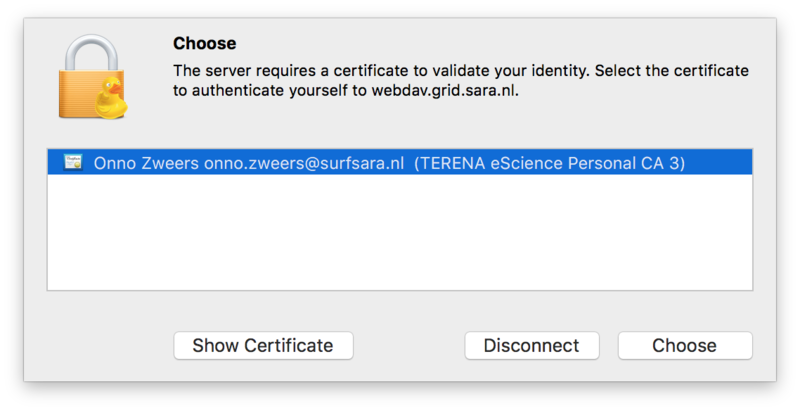 If your institute blocks outgoing traffic to port 2882 and 2883, you can use server webdav-cert.grid.sara.nl and port 443, as described at the top of this page. Right-click the bookmark and choose “Connect to server”. Mountain Duck is a WebDAV client that can mount WebDAV in OS-X and Windows. We’ve had some mixed results using it with dCache, so you should test it before trusting it with your data. You can find it at https://mountainduck.io/.